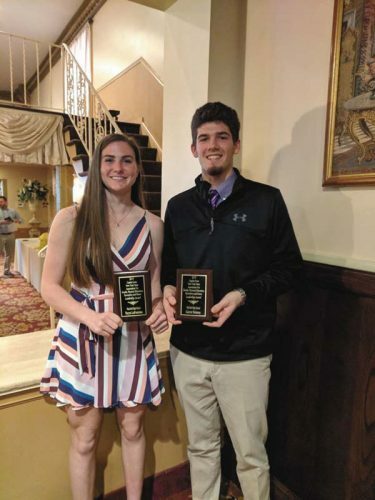 SCHODACK — The Broadalbin-Perth girls track and field team placed second and the boys team was third at the Maple Hill Invitational on Saturday. In the girls meet, host Maple Hill won the team title with 107 points. Broadalbin-Perth was second with 65 points and Ichabod Crane was third with 57 points. Ava Tyler won the pole vault for the Lady Patriots with a school-record height of 10-0. Tyler also was second in the 400 hurdles with a time of 1:13.11 and sixth in the 100 hurdles with a time of 22.60. Gabby Larsen was second in the 800 with a time of 2:34.17. She also was second in the 1,500 with a time of 5:18.18. Hailey Parrotti was second in the long jump with a leap of 16-1 3/4. She also was third in the 100 meters with a time of 13.22 seconds and third in the triple jump with a leap of 33-0. Rose Barnhart was fourth in the 3,000 meters with a time of 12:38.17, while Caitlin Palmateer was fifth in the shot put with a throw of 28-8 1/4. The team of Amirah Carsno, Erica Lin, Parrotti and Tyler placed fourth in the 400 relay with a time of 55.65 seconds. In the boys meet, host Maple Hill claimed the team title with 138 points. New Paltz was second with 125 points and Broadalbin-Perth was third with 74 points. John Coddington won the shot put for B-P with a throw of 47-11. He also placed second in the discus with a throw of 118-10. Aidan DeJong won the discus for the Patriots with a throw of 126-11. He also was sixth in the shot put with a throw of 39-7 1/4. Tino Mancini was second in the shot put (43 1/4) and fourth in the discus (116-7). A.J. Christopher was third in the 1,600 with a time of 4:47.44 for B-P. He also joined Preston Hadley, Jon Murphy and Micah Smith to place third in the 3,200 relay with a time of 9:03.15. Murphy (2:13.22) also was fifth in the 800, while Smith (11:11.31) was fifth in the 3,200. Danny Dylong (11-0) was third in the pole vault, Jon Simmons (1:02.45) was fourth in the 400 hurdles and Jeff Shlomovich (1-0-6) was fourth in the pole vault. The team of Kyle Henry, Shlomovich, Simmons and Dylan Travis was fifth in the 400 relay with a time of 47.75 seconds, and the team of Christopher, Henry, Murphy and Simmons was fifth in the 1,600 relay with a time of 3:52.65. TROY — The Johnstown and Galway boys and girls track and field teams competed at the Christian Brothers Academy/LaSalle Relays on Saturday. The Johnstown boys placed third with 72 points, while Galway was ninth with 27 points. The Galway girls placed sixth with 48 points, while Johnstown was seventh with 47 points. In the boys meet, Ballston Spa won the team title with 102.5 points and Colonie was second with 102 points. Johnstown’s Sebastian Mills was second in the 2,000-meter steeplechase with a time of 6:55.57. Mills, Nolan Hayes, Matthew Boyle and Trey Stover won the 1,600 relay for the Sir Bills with a time of 3:39.19. Johnstown also won the shot put relay as the team of Brady VanAernam, Victor Orsell and Tanner Warner combined for a total of 106-1. The Sir Bills also won the discus relay as the team of VanAernam, Orsell and Warner posted a total of 293-0. Galway’s Holden Decker (4:40.91) was fourth in the 1-mile run, while Johnstown’s Josh Peck (5:43.63) was sixth. In the 400 relay, Johnstown’s Evan White, Boyle, Ryan O’Connor and Stover were third with a time of 46.41 seconds. Galway’s Charlie Clark, Steve Mothon, Joshua Rumsey and Peter Stewart were sixth with a time of 48.95 seconds. Clark, Mothon, Rumsey and Adam Smith placed sixth in the 4 x 200 relay for Galway with a time of 1:43.57. In the 3,200 relay, Johnstown’s Justin Ferrara, Ethan Maxson, Terrance Strumbrice and Cody Draper were fourth with a time of 9:38.38, while the team of James Hilton, Aiden Holbrook, Ryan Ingle and Decker were sixth for Galway with a time of 11:04.85. In the 4 x 1,600 relay, Hayes, August D’Amore, Jake Wesley and Mills placed third for the Sir Bills with a time of 21:13.86. Galway was sixth in the sprint medley relay as the team of Ingle, Holbrook, Smith and Stewart posted a time of 4:11.22. Johnstown’s Mark Cwiakala, Ferrara, Mark Cwiakala and Wesley posted a time of 13:42.58 to place third in the distance medley relay. In the high jump relay, Joseph Matthews, Boyle and Hayes combined for a height of 16-4 to help Johnstown place second. In the girls meet, Saratoga Springs won the team title with 150 points, Albany was second with 77 points and Colonie was third with 67 points. Galway’s Natalie Zembsch (5:53.09) was fifth in the 1,500 meters, while Galway’s Samantha Grant (5:54.12) was sixth. Johnstown was fourth in the 400 relay as the team of Molly Hotaling, Julie Wager, Mary Austin and Jenna Thompson posted a time of 57.35. Galway’s team of Sara Ernst, Anna Meisenburg, Kim Lacerais and Rachel Wnuk was sixth with a time of 58.49 seconds. In the 1,600 relay, the team of Thompson, Talia Anderson, Molly Lake and Abigail Gottung placed second for Johnstown with a time of 4:20.14. Galway’s team of Emma Jordan, Siela Zembsch, Natalie Zembsch and Grant was second in the 3,200 relay with a time of 12:04.44. In the 4 x 1,600 relay, the team of Sarah Smith, Jenna Parslow, Carolyn Fitzpatrick and Lake was third for Johnstown with a time of 25:34.34. Anderson, Wager, Gottung and Katie Romano was sixth in the sprint medley for Johnstown with a time of 5:03.71. In the distance medley relay, Smith, Fitzpatrick, Parslow and Brooke Grace posted a time of 15;41.73 to place sixth for Johnstown. The Lady Bills were third in the high jump relay as the team of Anderson and Hotaling posted a total height of 12-8. Galway was fifth as the team of Rachel Wnuk and Julia Reedy posted a total height of 8-5. The Golden Eagles placed third in the long jump relay as the team of Natalie Zembsch, Siela Zembsch and Jade Siculuna posted a total distance of 36-4. In the triple jump relay, Galway was second as the team of Rachel Wnuk, Meisenburg and Reedy combined for a total of 83-4 3/4. Johnstown was second in the shot put relay as the team of Gabby Palmer, Abbie Rizzo and Calyer Fagan combined for a total of 71-9. Galway was fifth as the team of Aila Bishop and Anna Wnuk combined for a total of 48-5. In the discus relay, Johnstown was second as the team of Kacie Adams, Emily Long and Gina Franko combined for a total of 150-0. Galway was fifth as the team of Bishop and Anna Wnuk combined for a total of 110-0. NISKAYUNA — The Amsterdam boys and girls track and field teams competed at the Niskayuna Warrior Classic on Saturday. The Amsterdam girls finished fifth with 46.5 points, while the boys placed 15th with 14 points. In the girls meet, Shenendehowa won the team title with 114 points, New Rochelle (96.5 points) was second and host Niskayuna (95) was third. Lauren Santiago won the 200 meters with a time of 25.69 seconds and the 400 metes with a time of 57.41 seconds. Gabby Stanavich was second in the 100-meter hurdles with a time of 15.52 seconds and third in the 400-meter hurdles with a time of 1:08.91. Jackie Stanavich was second in the high jump for the Lady Rams with a height of 5-0, while Kayla Sondrup (4-8) was sixth. Amsterdam was fifth in the 1,600 relay as the team of Skylar Grybos, Sondrup, Stanavich and Santiago posted a time of 4:16.39. In the boys meet, Schenectady won the team title with 65 points. 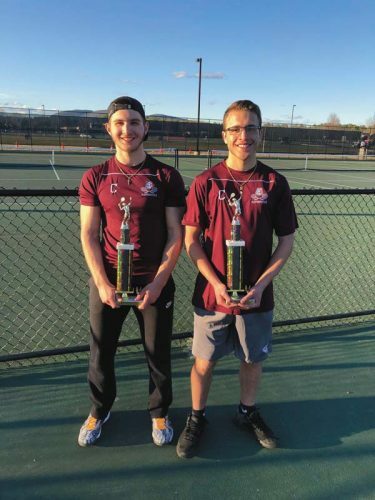 Columbia (63 points) was second and Colonie (59) was third. Marcos Santiago was fourth in the 400-meter hurdles for the Rams with a time of 1:02.25, while Garrett McHeard (43-3/4) was second in the shot put. The team of Angel Sanchez, Trevon Joyner, Robert Martinez and Santago posted a time of 45.83 seconds to place sixth in the 400 relay for Amsterdam. The Rams also placed sixth in the 3,200 relay as the team of Jacob Gomez, Trevor Dzikowicz, Antonio Reyes and Chaun’J Ramos posted a time of 8:49.43.